Our largest percentage of the current collection involves some very active participation in the Mexican Gray Wolf SSP and the recovery program. 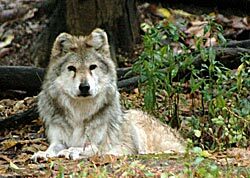 As of December 2008, nearly 40 Mexican gray wolves currently call Missouri "home", living in 10 different enclosures and in groups of 1 to 10, depending on their social needs at this time, as well as the needs of the Species Survival Plan (SSP). All of the animals are owned by US Fish and Wildlife Service and the Mexican government, and are managed under their strict guidelines. These guidelines are in place to ensure that the goals of the captive community are met, but more importantly, the goal of returning Mexican gray wolves to suitable areas in the southwestern US and Mexico. Nearly every pack of Mexican wolves in the wild has a direct tie to wolves that were born at the Center, something that reflects the management of the animals at the Center. Lastly, another significant role that the Center plays in their recovery is in behavioral and reproductive research, with the assistance of experts at the Saint Louis Zoo. Look for more information on this exciting research in future "keeper notes" on the WQ website. 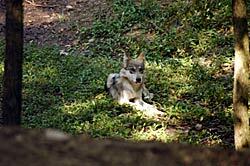 Also, for more specific information about the Mexican gray wolf program, see Mexican Gray wolf recovery website. Frijole was born on May 10, 1995 at the Arizona-Sonora Desert Museum. Unlike most Mexican gray wolves, Frijole was hand-reared by humans because at the time of birth Frijole's mother had a communicable disease that could have been passed on to the pup through her milk. Because Frijole had no littermates of her own, she was placed with a Siberian husky pup for companionship while being hand-reared. 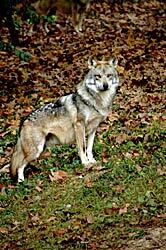 Upon her arrival at the Endangered Wolf Center in December of 1995, seven-month-old Frijole was a bit nervous and high-strung. Frijole's hand-rearing and non-wolfish behavior caused some concern over how she would fit in with other wolves. To ease her into her new environment she was placed with several different males in the hopes that their vigilance would allow her to relax. In 2001, Frijole was placed with a new mate, Alano, a former resident of the Endangered Wolf Center. The bond between Frijole and Alano was immediate and strong. Their habit of lying close to each other, nuzzling, and walking side by side made them a favorite pair among our volunteers and visitors. Alano even managed to help Frijole begin to let go of her figure-eight running. She bred with Alano several times but had never successfully reared her young. 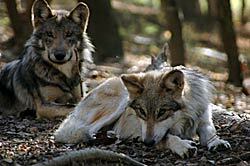 In 2005, the Mexican wolf Species Survival Plan (SSP) committee decided to try a different technique that involved artificial insemination with the help of a specialist from Norway. This technique would allow Frijole and Alano to remain together as a bonded pair, but another wolf, Dude, would hopefully be the sire of the pups due to his genetic value in the program. We would later confirm with ultrasound that she was pregnant with three pups, a male and two females! On May 1, 2005, Frijole gave birth and the pups were pulled for partial hand rearing and then returned to Alano to rear when they were weaned. In the fall of 2005, Frijole was reunited with Alano and the puppies. This was the first time artificial insemination was successful with Mexican gray wolves and is a technique that has great promise for wild Mexican wolves, as well as other endangered canid species. 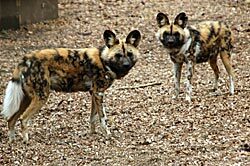 The two female pups were sent to another facility when they became adults and Frijole, Alano and her son, now named Perkins, remained together as a pack until Alano died in the winter of 2008. In the fall 2009, Frijole was separated from Perkins, since he was recommended to be paired for breeding to one of our other females. Because of her age and physical limitations (after all, she is almost 15 years old) the decision was made to allow her a private retirement enclosure. Although she is housed alone, she interacts with her two male neighbors and has not shown any sign of stress with her new housing arrangements. Picaron, which means "rascal" in Spanish, was born on May 3, 1998 at the Cheyenne Mountain Zoological Park in Colorado Springs, CO. He lived at the United States Fish and Wildlife Service's (USFWS) Sevilleta National Wildlife Refuge in Socorro, NM and at the Ladder Ranch Mexican Wolf Captive Facility in Caballo, NM. It had been hoped that he would breed at one of these "pre-release" facilities and then be released into the wild with his family pack. However, Picaron never bred and had aggressive behavior towards food, and therefore was not a candidate for release into the wild. 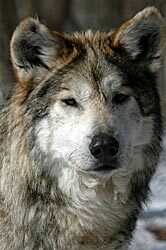 Picaron was transferred to the Endangered Wolf Center in 2002, and was paired with Tanamara, a young female wolf that had a strong enough temperament could handle Picaron's equally dominant behavior but yet would be submissive enough when it came time to mate. Over the years the pair has had several litters of pups, which have since been sent to other facilities that participate in the Mexican wolf program. Sadly in early 2009, Picaron's mate died suddenly and he is currently housed alone. Although he howled quite a bit for about a week after Tanamara's death, he appears to have adjusted well and interacts quite a bit with other neighboring animals at the Center. Picaron is also quite a hit at our campfires and wolf howls, where his clear, baritone howl is easily distinguished from any other wolf we care for. 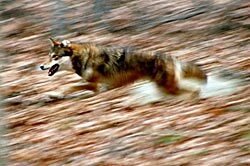 Another significant role that Endangered Wolf Center plays in wolf conservation is the recovery of the red wolf, another USFWS guided recovery program, as well as an SSP. Although the number of red wolves has decreased over the past 10 years, we are still very active in recovery and education efforts for this controversial species. Some of the first red wolves born in captivity were born here, as well as the first red wolf born in the wild was born to a WCSRC animal. 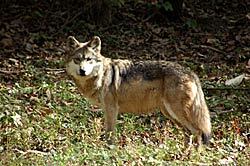 As with the Mexican gray wolf recovery program, many red wolves in the wild have ties to the Center. 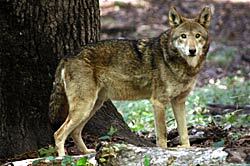 The Endangered Wolf Center currently maintains a single pack of red wolves, an adult pair and their offspring from 2007. 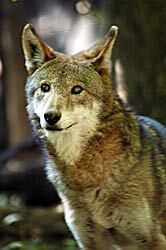 Inapa, a red wolf pup, was born April 26, 2007. Inapa was born into a multi-generational pack consisting of her parents, Tala and Durham, and yearling siblings, Rufus and Meoquanee. The name Inapa is Lakota Sioux for "one who has overcome hardship". The name is fitting because although Inapa is young, she has proven to be a very resilent. In July of 2007, keepers found Inapa inside her feeding area missing part of her leg. She was rushed to the Saint Louis Zoo where the rest of the leg was amputated. After her return from the zoo, she was housed with her mother to heal. 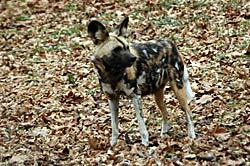 Slowly, Inapa was reintroduced to her father and brother and the four animals were a close knit family pack. Since her amputation, Inapa has had to learn to walk and run with only three legs. She has proven to be very resilient and is certainly an inspiration to watch. 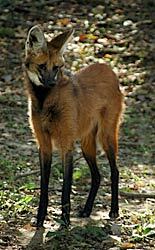 When people hear the word "maned wolf", they often believe that they are related to other wolf species. 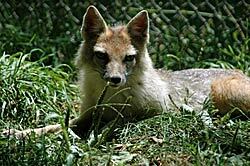 In fact, they are not a wolf at all, and are a very unique canid found in South America that looks more like "a fox on stilts". The Center is proud to participate in the SSP program for this species, and has had considerable success with breeding and rearing several groups of animals. Although we have maintained several pairs and their offspring over the years, we currently care for a single breeding pair. We are hopeful that this new pair will produce a litter of pups this winter, but if not, then in the years to come. This pair is particularly important to the SSP because both animals are recent descendants of Maned wolves from the wild in Brazil. 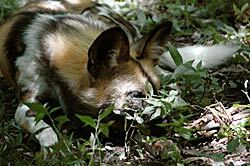 While the majority of the animals in our collection are managed for reintroduction programs, the African wild dogs are one species where some contact is encouraged by the SSP. Because of their potentially dangerous nature,their sensitivity to anesthesia and temperature changes, and their annual medical needs, some husbandry training is permitted. Behaviors that would minimize any stress during a capture, such as hand injection of vaccines or anesthesia are one such example. However, there are many other behaviors that can be trained that aid in the daily medical checks and animal care. Nearly 20 different behaviors have been trained at other facilities, and our pack of four brothers are currently trained on 10 behaviors such as "mouth open", several different "down" positions, as well as allowing for hand injections. 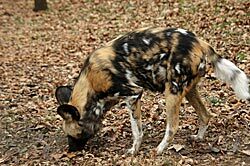 These animals are easily distinguished from other canids by their distinctive yellow, black and white coats, and their large rounded ears, which help them to dissipate heat and hear high frequencies. Each animal's coat is as unique as a human fingerprint, allowing the dogs (and us) to distinguish one from another. Researchers believe that the color patterns allow them to recognize each other at distances of 50 to 100 meters. 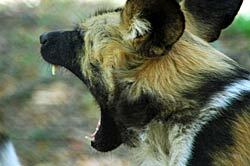 Their social behavior also sets them apart from other canids. They spend about 80% of their time in close association with one another, more than any other species of canid. Tsavo, Dogo, Datoga, and Magadi were born at the Denver Zoo in Colorado on January 30, 2003. On October 31, 2003, the brothers arrived at the Endangered Wolf Center and were a welcome addition to the animal collection and for the visitors to the Center. Right away, it became evident that each animal had a very distinct personality and appearance. Tsavo with his distinct white rump loves to stir up trouble and often sneaks up behind the others to steal their bones. Dogo, distinguished by the white "Hershey's kiss" design on his right side, loves to eat and is always the first one to reach the food enrichment items. Datoga, with the white "S" on his left side, is definitely the most vocal and is constantly purring or growling. Finally, Magadi, the only one with a pure white tipped tail, loves to jump into his water tub and play in the water. One of the often overlooked canids of the world are the foxes. 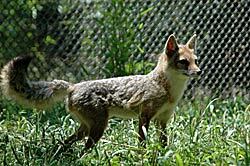 Although they may not be as "charismatic" as wolves and some of the larger canids, the foxes in the world are under some of the highest pressure of extinction due to habitat fragmentation or competition by larger canids. One of those is the Swift fox. Although not currently listed in the U.S. as endangered, they are a species that has been recently reintroduced in areas of Canada and South Dakota. Some of the kits that were born at the Center were used in the restoration program in Alberta, and now the population is close to 900 animals, where there were nearly none about 20 years ago. 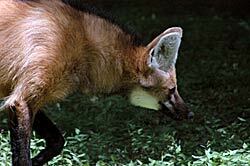 We currently maintain an older pair of fox.